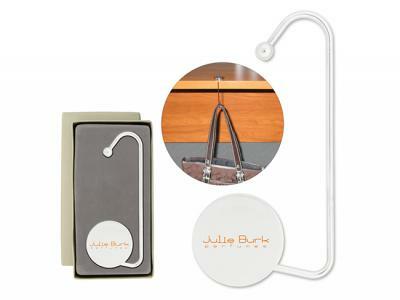 Print your logo onto these custom printed monico bag hooks or one of our other innovative accessories & jewellery and use them in your next marketing campaign as a unique giveaway item. Monico Bag Hooks are a polished chrome metal handbag holder with hook. Hang a handbag from the edge of a desk, table or chair. Optional Free Laser Engraving included in the price as Printing will fade over time. Comes in a gift box. Prices shown include laser engraving or 1 Colour Printed Logo on 1 position. This quick turnaround promotional item can be produced within 1-4 days - rush fee of $0.60 per unit. Custom brand these 80's retro style tin badges (100mm) or one of our best-selling promotional accessories & jewellery with your company logo! Engraving your logo on the promotional monico bag hooks is usually done by Laser engraving, where the laser removes a thin layer of the metal surface. Your logo becomes part of the monico bag hooks and is impossible to remove. Sometimes the engraved effect will be a different metal colour to the outside metal coating of your product. We can also engrave wood or plastic. Engraving is usually a more expensive branding method. Personalize your monico bag hooks or custom design accessories & jewellery for your marketing campaign. How can these unique promotional monico bag hooks or our personalized accessories & jewellery fit in with your marketing strategy and help you maximize your brand exposure? Our custom made Monico Bag Hooks can be produced from a minimum quantity of 100 pieces. We can have your logo branded on these corporate Monico Bag Hooks in Engraved or 1 Colour Pad Print. A setup fee of US$84.00 will apply to make the film.